Although starting out more than 20 years ago in the Welsh village of Cwmaman, it wasn't until 1996 that Stereophonics secured management, a record deal (with V2) and embarked on a world tour in support of their first album Word Gets Around. Enter front of house sound engineer Dave Roden, sound rental company, Capital Sound Hire and Martin Audio. That three-way relationship with the band has remained intact from day one. Seventeen years on, Kelly Jones and Co. have just completed another successful arena tour to give some exposure to the recent album, Graffiti On The Train, as well as old back catalogue favourites like Dakota. Roden retains a fierce loyalty towards Capital Sound and has never been let down by their recommendations. “I started with the old [Martin Audio] F2,” he remembers fondly, “and then moved on to Wavefront technology, the W8L Longbow and LC line arrays — and now I’m using MLA.” This tour also boasted a number of Stereos crew veterans — none more so than Harm Schopman, Dave Roden’s previous system tech, who this time around took on the role of crew chief, leaving Toby Donovan to fill the breach. 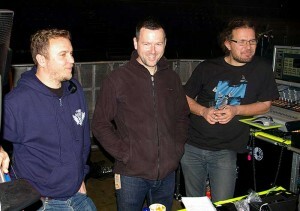 Another who backed the decision from the outset was band manager Dan Garnett. “He was also very enthusiastic about the improvements that MLA could bring to the audio and so the deal was done,” reports Roden. 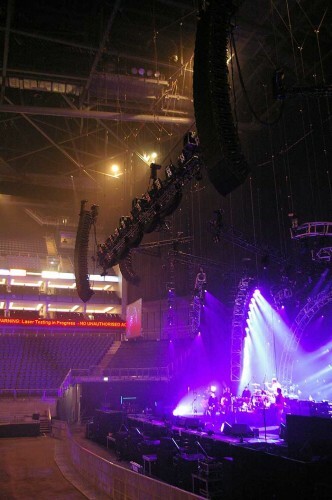 For the closing night of the tour at O2 Arena, the scalable MLA system was rigged 16 MLA and two MLD Downfills per side for the main hangs and 13 MLA and an MLD for outfills. Subs comprised 14 MLX in a broadside castellated sub array, while a further 12 W8LM Mini Line Arrays, arranged in six stacks, provided infills. As for monitors, Adam Zindani and Richard Jones used a pair of Martin Audio’s classic LE700, while Kelly Jones relied on two pairs of LE700 — one pair in front and one pair behind. The side-fills consist of a Martin Audio 218 and W8C per side (while a separate 218 was deployed as Jamie Morrison’s drum sub. But the real differentiator for the ‘stereosonics’ team was the sub array — with those 14 MLX subs in landscape formation (nine at the bottom, five reverse facing on the top). “Because it’s a cardioid pattern, this really helps the rear rejection,” notes Harm. The fact that Toby Donovan doesn't have to undertake manual zoning or climb up the back of the room with measurement mics do much to reduce the time required to optimise the system. “This system improves upon the limitations of the typical zoned approach to line array optimization and avoids the use of presets. Instead it relies on accurate predictive modelling,” he confirms. Mixing on an Avid Profile (with a fairly flat EQ) the average Leq at FOH was generally around 100-101dBA. “The variation was -3dB at the furthest audience points,” he noted. Summing up MLA, he concludes: “This system is the best thing I have heard, it’s as simple as that. I have used all the other systems — and all of them can sound brilliant too — but it’s the extra facilities that the others don't have that makes this what it is.